Mr. Gaurav Saini has a rich experience of more than 12 years in many domains i.e. Sales, Operations, Training & Development, Customer Service, OD and General Management. Prior to joining Tata AIG, he worked with a number of big companies i.e. Fed Ex, AMWAY Corporation, Max New York life Insurance, Aviva, Hewitt Associates. Mr. Gaurav Saini also shared some of his own experiences from the corporate world and gave a detailed view of the culture being followed by sales executives. The participants showed an overwhelming response to this session as they found the matter really close to the reality and appreciated the experiences shared by the speaker. The session was very interactive and audience’s all queries and concerns regarding the life and culture in the corporate world were very nicely addressed. The session marked a great success of the initiative to foster learning and sharing. 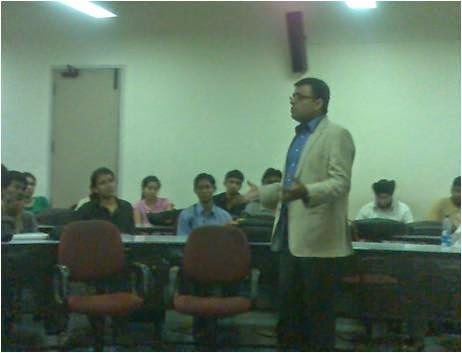 Participants attended the session with great enthusiasm and zeal.